Access and Equipment Ramps . 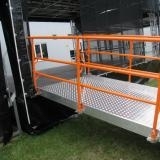 We can now supply ramps for use with all our stages. They make loading equipment on to the stages a lot easier and quicker. 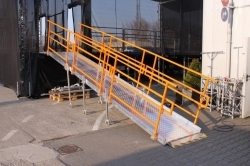 All ramps are of aluminum construction with orange coloured safety rails. 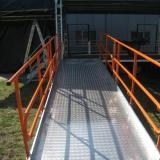 The ramp in the picture is 6m long and can access the 1.5m performing height of the stages with ease. Also very usefull when wheelchair access is required.